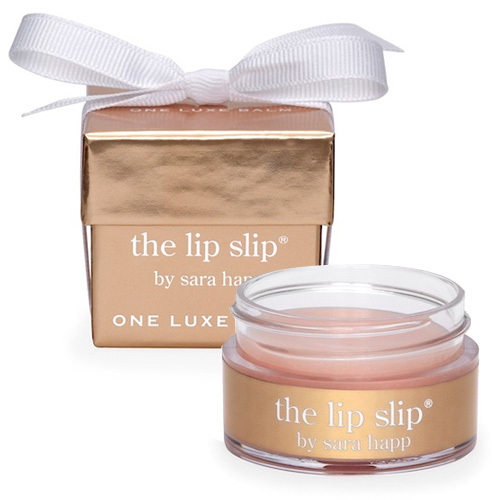 Sara Happ is a cult brand specialising in lip care products and is best known for The Lip Scrub. I was recently sent the complementary product to the scrub, The Lip Slip, a rich lip balm. Presented in a gold gift box tied with a grosgrain ribbon, The Lip Slip feels special from the moment you first see it. The balm itself is a very thick, somewhat sticky formula packaged in a perspex tub. As a general rule, I prefer stick format lipbalms which I can apply on the go without having to worry so much about it being unhygienic so in this respect, I felt let down by the packaging. The Lip Slip applies clear with a slight gloss and has a scent which reminded me of candied chestnuts. I was initially sceptical over whether The Lip Slip would actually work and thought that it would simply be a gimmicky product that was enjoyable enough to use but which didn't really deliver results. I needn't have worried. It's amazing! It turns out that The Lip Slip is packed with conditioning ingredients such as Sweet Almond, Jojoba and Macadamia Nut Oils. With the emphasis upon quality ingredients, a little goes a long way. When I applied a small slick to my very dry lips before bed, The Lip Slip worked its magic and I woke to soft, smooth lips- incredible! At £19, it's certainly a pricey lip balm but the fact that Sara Happ has chosen to specialise in lip care products shines through as this really delivers. I'd recommend it for very dry, chapped lips, particularly during the winter months.